I think neon gradients will be huge this summer, and I think they look especially awesome when blended with a neutral colour! My base colour here is Barry M Coconut (my absolute favourite neutral right now) and I used Models Own Flip Flop and a make-up sponge for the gradient. I haven't used a striping brush in ages (can't you tell?) so I decided to dust one off and add a little twist! 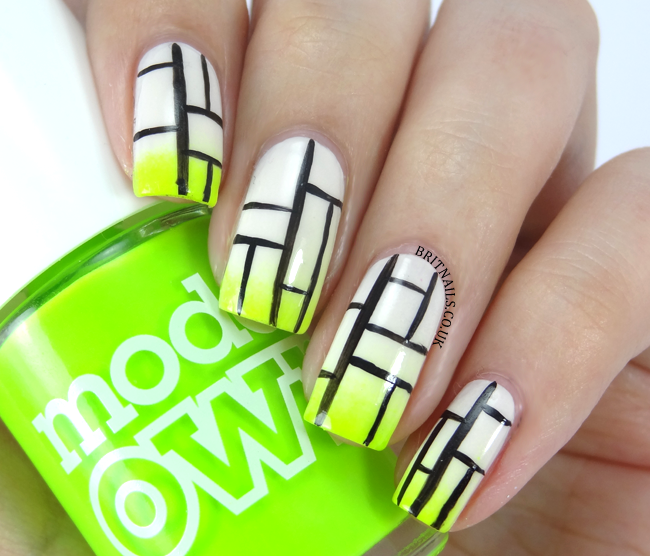 I freehanded the geometric pattern with black acrylic paint, and finished with a top coat of No.7 Stay Perfect. My lines are far from perfect, especially in close up pictures. I need to practice! Oh wow, this is incredible! One of my favourite manicures from you ever I think! I love the combination of neons and neutrals - I'm definitely going to have to invest in some neons this summer! It looks nice. I'm against being perfect all the time, being not perfect is human. I especially like the neon tips and I usually don't like neons, but you did it lovely. How long do the neons by Models Own dry btw? The tip just makes it perfecttt.